Let’s get one thing straight. A sweet potato french fry is not a real french fry. I like them, I’ll eat them … but they’re not a real french fry. They are french fry substitutes to be eaten when a real french fry can’t be found. Yes, I know. But you loveeeeeeeee sweet potato french fries. You like them wayyyyyyyyyy better than regular french fries. That’s because you’re an amateur. I on the other hand, am a french fry professional. I have been eating, making and lusting after french fries for as long as I can remember. I ate french fries every single day for lunch while I was in highschool. Large fries with gravy please. At the end of grade 13 … yes we had grade 13 back then … I threw up a ball of grease. So … clearly … a professional here. Best way to eat a french fry? Salty and hot with your fingers, while walking around a flea market. Using one of those wooden forks is pretty good too. Best potato to make a french fry with? A baking potato like the Russet or Idaho because the high level of starch makes them relatively dry and therefore easier to get crispy. Best outfit for eating french fries? Shorts, flip flops and a tank top. So … clearly … again … a french fry professional here. 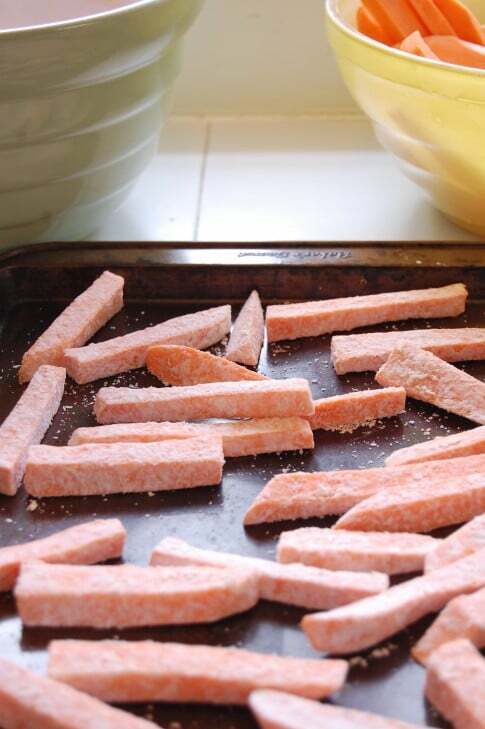 But … if you’re on some sort of stupid meal plan, or you’re all out of regular potatoes, or you just feel like having something a little different, why wouldn’t you cook up some Sweet Potato French Fries? Because they’re soggy messes. That’s why. I’ve oven baked them, par boiled them and deep fried them and they don’t get crispy. They get brown, but not crisp. Finally, I’ve figured out how to make crispy sweet potato fries and the best part is you can do them in the deep fryer or the oven! Either way, you’ll end up with crispy fries. Guaranteed. But like with most things, you’re more guaranteed if you do them in the deep fryer. Also get some olive oil. Just the cheap stuff. Not the good stuff like my favourite Lorenzo No.5. Seriously best tasting olive oil ever. Peel your sweet potatoes. I have used the same brand of vegetable peeler for 15 years now. It’s the cheapest, most basic vegetable peeler around and it’s pretty much every cook’s favourite. It’s the Great Lash mascara of the vegetable peeling world. Cut your sweet potatoes until they’re a medium thickness. Not hugely thick cut and not shoestring. Throw a Tablespoon or two of cornstarch into a plastic bag. Dump a handful of sweet potatoes into the bag with the cornstarch. You don’t need to dry them with paper towels or anything. Just drain the water and then give each handful you drop in the cornstarch a good shake. Twist the top of the bag so it forms a balloon with some air inside and shake the fries around until they’re lightly coated with the cornstarch. This is important. Too much water and too much cornstarch and you’ll end up with a goopy mess. Plus your fries will taste like cornstarch. 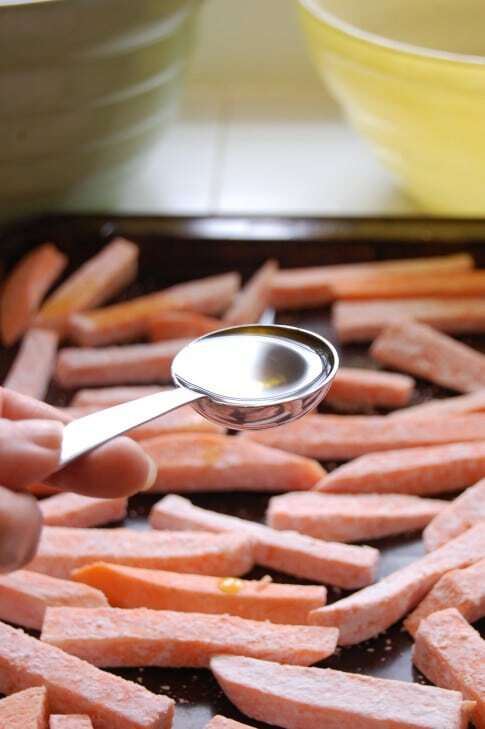 Put your coated fries on a non stick cookie sheet. Drizzle 2 Tbsps. of olive oil over the fries. This is if you want to be healthy. Any vegetable oil will work. I’ve used sunflower, canola, etc. etc. You can use as much oil as you want. I usually go the totally unhealthy route to ensure the fries are crispy. Just keep glugging the oil until the fries are well coated. Using your hands, make sure the fries are well coated. Arrange them on the sheet again, so they have space between each fry. The less fries on the pan the better they’ll cook. Too many shoved together and they’ll never get crispy. They’ll just steam. So do NOT overcrowd the pan. Pop the fries into your preheated oven and cook for 15 minutes. Meanwhile you can make the dipping sauce. Mix together 1/2 cup of mayonaise with 1 teaspoon of Sriracha sauce and 1/4 teaspoon of Cayenne Pepper. You can adjust the proportions to taste. Mix it up and taste it then adjust as you like. Check the fries after 15 minutes, flip them over (you might have to use a spatula depending on how “non stick” your pan is) and return to the oven if necessary for another 5 minutes. The timing really depends on the size of your fry, the heat of your oven and how well your pan conducts heat. Maxwell Williams French Fry and dipping cup!! If you prefer your fries deep fried, throw them in the deep fryer at the highest setting for a few minutes instead of sticking them in the oven. You STILL need to coat them in cornstarch. 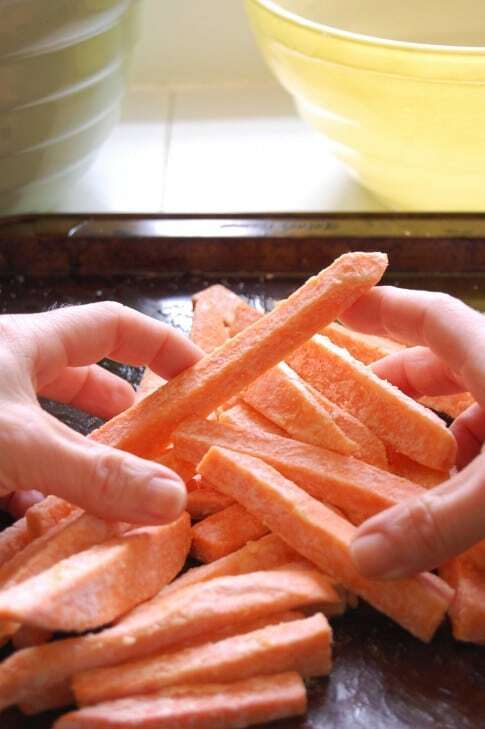 Even in a deep fryer, sweet potatoes fries won’t get crispy unless they have a coating of cornstarch. This is how I do them when I’m in a rush. They’re always crispier than those from the oven, but far less healthy. Peel sweet potatoes, slice into medium thick slices (closer to thin than thick). Soak potatoes at least 4 hours in water. 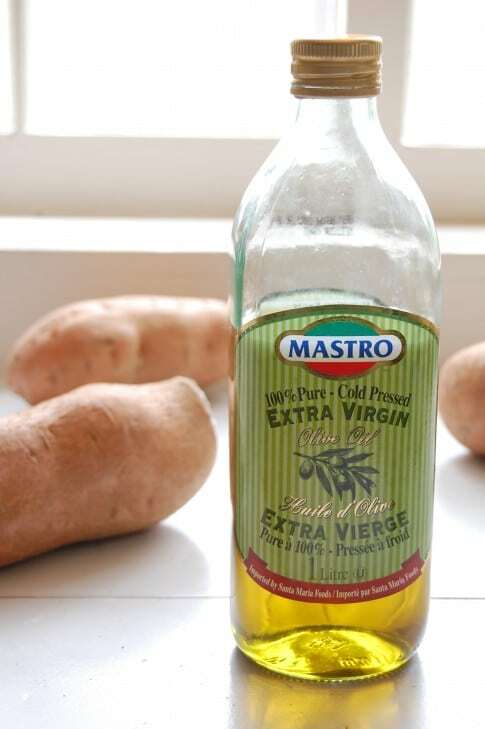 Drain water from sweet potatoes and shake dry with your hands. 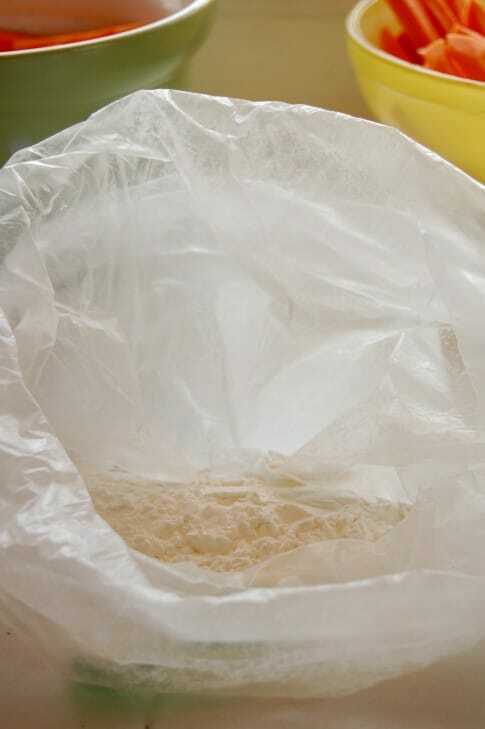 Put 1 Tablespoon of cornstarch into food safe plastic bag. 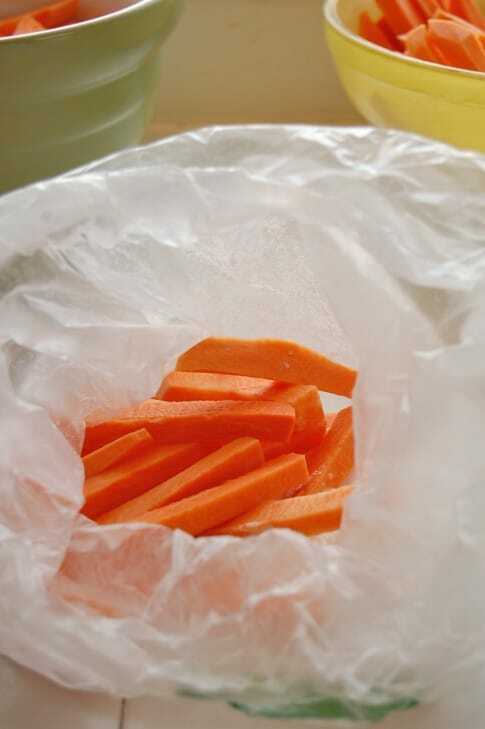 Dump sweet potato fries into bag, blow some air into it, and shake bag until fries are coated. Place fries on cookie sheet, drizzle with a couple Tablespoons of olive oil. Toss fries until evenly coated with oil. Arrange on cookie sheet(s) with lots of space in between fries to prevent steaming. Cook in hot oven for 15 minutes then check. The fries will release from the pan when they're ready to flip the same way a steak would. Flip fries, and continue to cook for another 5-10 minutes. 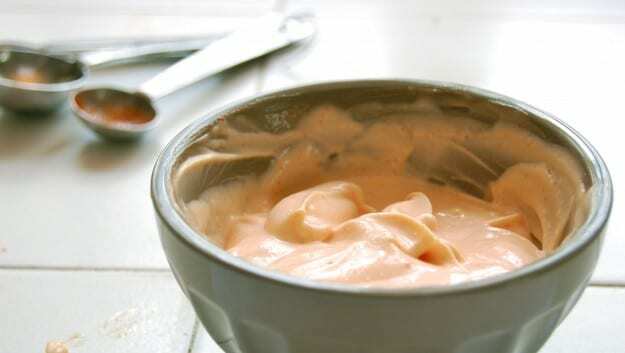 Dipping Sauce: Mix together mayo, pepper and Sriracha sauce. Adjust to your taste. Please note : This recipe does have a bit of a learning curve. It may take a few attempts to get your proportions of corn starch and oil correct. It took me several years to figure out how to do this, but with these instructions it shouldn’t take you more than a couple of tries. You are a genius. Just bought some sweet potatoes and will have to try this. Question: I like Sriracha sauce but I get migraines from MSG. I can usually handle a little bit (honestly, you don’t need much of the stuff), but was wondering… Does an acceptable alternative exist? I’ll definitely use the heavier dose when I make this! I used regular hot sauce – Chaluha; twas tasty! the fries were a big hit at home. You could probably use greek yogurt instead of the mayo too. Greek Yogurt and mashed avocados are my subs for mayo almost all the time. So, these were EPIC. By far the best sweet potato fry recipe I have tried. I did use use greek yogurt instead of mayo and it was tasty as well. I added dijon mustard, sriracha, and lemon. It could use some altering but the greek yogurt and sriracha was definitely a good starting point. Thanks for the recipe! 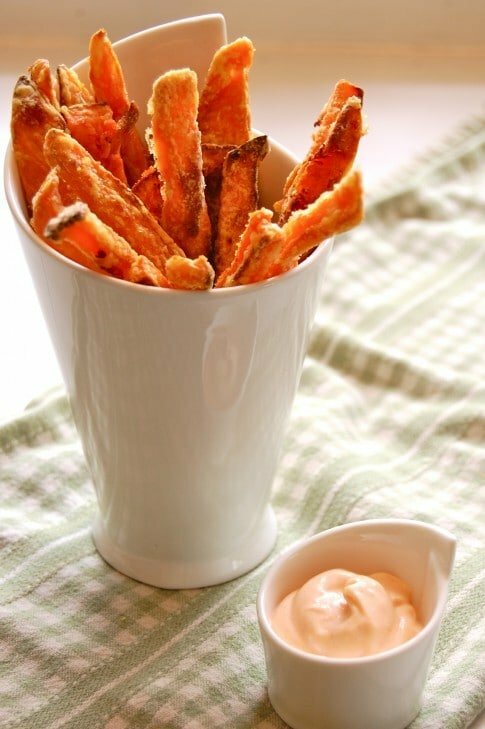 Sweet potato fries are also good with mayo mixed with curry powder and lemon juice. So if you are using 1/2 cup mayo use maybe 1/2 – 1 tsp curry powder and the same amount of lemon juice. 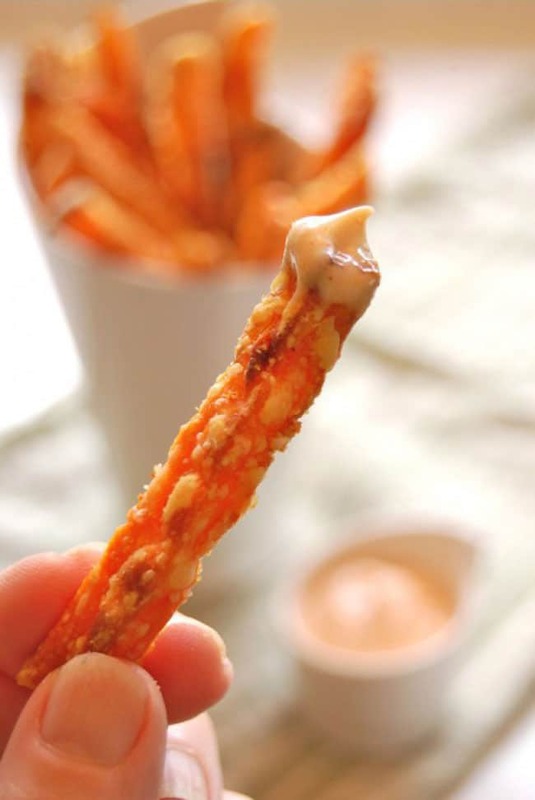 even better to eat with sweet potato fries is curry mayonnaise sauce. It’s mayonnaise mixed with curry powder and salt until it tastes yummy to you! Emma I use that for dipping artichokes! Sooo good! I just made these and they were the strangest/weirdest fries I have ever had. I cooked them for 40 minutes and they still weren’t crispy. The corn starch was still like dry corn starch and the inside of the fries was just plain weird. Definitely won’t try these again! Actually they were no more packed on the pan than they are in your photo. And I used slightly more oil than you said to because I wanted to make sure there was some on each fry. Just didn’t work out well. sounds like you didn’t use enough oil. or maybe your oven wasn’t hot enough (try an oven thermometer). either way, i made these tonight and they were amazing so the issue is definitely with you and not the recipe. I tried these tonight and I have to say I’m in the failed camp. I soaked them in cold water for around 45 minutes. After 30 minutes on 450F, they still weren’t crispy. I practically dipped each one in oil. The bottom of each fry got a lot of colour (even black!) but the rest of the fry remained soggy and pasty. I’ve seen other recipes that use cornstarch as a coating to get that crisp (like calamari) which is why I was sure this would work but I don’t know it didn’t. I might try it again sometime though. Hi Doris – Did you turn the fries every 15 minutes? Also the oven temp. should be at 425, not 450. Maybe that was just a typo on your part. If all else fails, use the same technique but put them in a deep fryer. But I would bet with a couple of more tries you’ll get it all figured out. ~ karen! People are reading your blog, therefore supporting you, and trying your recipes…. to immediately blame them for doing something wrong, as you sit all high and mighty is a little rude, and very untactful of you. Perhaps some manners in the new year. Dear person who refused to give their name or email address. Shove it. ~ karen! I am so proud of you for telling Anon. to shove it! 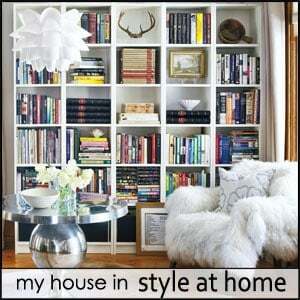 Just one more reason I follow your blog! 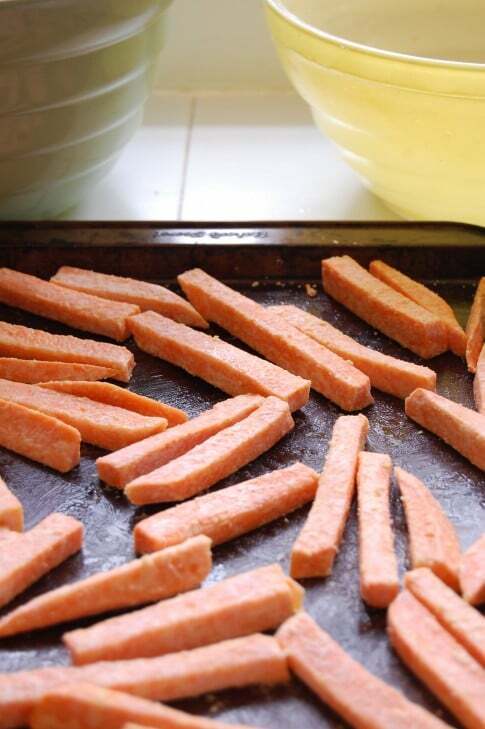 I love sweet potato fries…especially baked in the oven with garlic infused olive oil and additive free salt…even if they are a bit soggy…so I will try these and keep playing until I get the proportions correct! 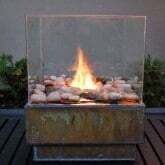 1) Natural gas oven vs Electric: one of the two major combustion products of natural gas is water vapor. If having fries just be close to each other is enough to keep them from getting crispy because of steam I can’t imagine putting them in a box with copious amounts of water vapor helps the situation…perhaps this only works best, or at all, in electric? 2) Potato variety: I deep fried the failed bakers. Still limp. As an experiment I let some go till they started to turn black. Charcoal must be crispy, right? If not “crispy” then “brittle” at least. Nope, still limp. I managed to make limp charcoal. The only logic I can imagine behind this is the variety of potato just isn’t suitable for crisping because of its chemical make up? Just made these for my dad and I, and they turned out perfect. I don’t ever measure anything so I just dumped some corn starch in a bag, and also added cornflake crumbs and a little mrs.Dash for some extra texture. I soaked the fries for about 4 hours, drained them and let them sit for about half an hour before mixing them up. I placed enough for a large serving for two people on the cookie sheet and coated in oil. Baked at 425 for 15 min, flipped, baked for 15 minutes, then broiled for 3 minutes. There were a few that got a little too crunchy due to the different sizes. Overall they were GREAT and I will definitely make them again. I had a lot of sweet potatoes that I needed to use so I cut them all into fries. The ones that I did not season I threw in the freezer. 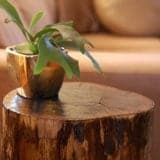 Any tips on how to make these next time? Can I bake them frozen or should I let them thaw before coating them and baking? 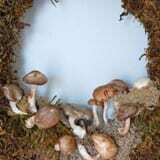 and do I need to soak them in water again? As someone who has tried these and failed to do it correctly, it seems that the amount of cornstarch is critical. 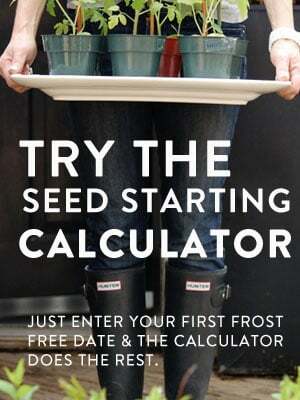 Karen noted in the post that it may take some trial and error to get the amount right. I used far too much cornstarch and the raw flavor was not good. BUT, I can see the point and think with a bit of tweaking these will be really good. Lucky for me I have another sweet potato so I can try again tomorrow. Can’t wait to get it right! Erica – I’ve also had good luck with putting the cornstarch coated fries in a bowl and drizzling (glugging) oil over them and tossing them with my hands. Then I put them onto the baking sheet which I’ve also drizzled (gluggled) oil onto. ~ karen! Synthetically produced chemicals and refined naturally occurring compounds do not usually behave identically in the human body so your point is moot. all of the MSG i have seen is fermented from corn. it’s not some wild, crazy synthetic chemical… it’s a “refined, naturally-occuring compound”, as you put it (grammatical corrections mine). Not to niggle, but she was right: you do not hyphenate compound modifiers that contain “ly” adverbs when used before the noun in the sentence. So “naturally occurring compound” is right. Big sweet tater fry lover here. About the sauce though….I use a mixture of chili paste (the kind you find at a Vietnamese or Thai restaurant), and ketchup. It’s delicious!! Not sure if this has been mentioned yet, but if you get JetPuff marshmellow sauce and heat it for about 30sec-1min in the microwave it is FANTASTIC for sweet potato fries… thank sweet potato casserole!! This was an addiction for several months in high school and is a guilty pleasure now that im a little older 🙂 Enjoy! 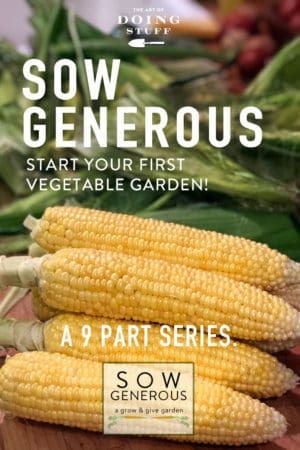 Barb – Just shake them vigorously so they aren’t soaking wet. 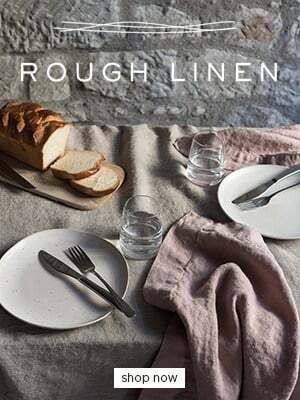 No need to actually dry them with paper towels or dishtowels. ~ karen! I’ve tried this a few times, and it seems for me, the trick for crispy fries is cooking them directly on a metal pan–no glass, no tin foil! I have just done my meal plan for this week, so I will have to go back and re-jig it to try and fit in the SP fries… Man I really want some now! We get different sorts of SP or ‘Kumera’ in NZ, the orangey ones like you’ve used and yellow ones that seem less sweet. Can I use either? I love the french fry tips! Thank you! But what I REALLY want to know: where did you get the cool french fry and matching dip bowls? LOVE THEM!! So glad that I’m not the only one who chooses regular fries over SP fries. My hubby LOVES SP fries, so we buy the ones in the freezer section for him. I can’t always find ‘real’ sweet potatoes here (small town in Northern Japan) and the Japanese sweet potatoes are NOT as good as regular ones, so we may have to wait a while to try your recipe. p.s. For regular fries, sprinkle them with garlic salt, MMMMMMMMMMMMM MMMMMMMMM GOOOOOOD! I bet you could use tapioca starch too! karen i also have had that problem and fing that the temperature of the oven makes a difference as well, it has to be quite hot. ok looked back and saw the temp posted sorry karen shoulda known you wouldn’t leave that out. My hero! I make sweet potato french fries for lunch about 3 times a week. I am so excited to try this I can’t even tell you! How do you come up with this stuff?? This is well timed! We tried to make SP fries on Friday night and like you said, they turned into a mushy mess. Take two will be coming soon, using your brilliant strategy! OMG. This is just what I need. My boyfriend (who runs a BBQ joint in a bar) had declared all crispy sweet potato fries to be FAKE since he couldn’t figure out how to get them crispy. Can’t wait to show him this. i do like sweet potato fries, but can we have a recipe on for reals french fries too?? And I just happen to have some sweet potatoes, sriracha mayo, some corn starch and even an oven on hand! Suh-weet! This works with butternut squash too, although I think I used regular flour instead of cornstarch…maybe? But you have to cook them a little longer. I also may try this with those cool purple potatoes, because those made crappy fries the one time I tried. it. I’ve redone my meal plan too. My son LOVES sweet potato fries. This will be a big treat for him. I’ve tried making them before and they were awful! First – I love a woman who enjoys fried foods. Second, great tip about the corn starch! I have tried a wide range of (baked) sweet potato fry recipes and always end up with soft mushiness. Delicious, but mushy. I can’t wait to try your way! Hey, ALSO: do you think baking them on parchment paper on a baking sheet would change anything? I don’t have non-stick ones and I’m not big on scrubbing them clean. I use my silpat when I make oven fries. It works really well and is so much easier to clean than a pan or sheet. I think parchment would work, just keep an eye on it, as the oven is pretty darn hot for these fries. I agree. They were the most delicious mush I’ve ever served. I had about 5 fries that miraculously didn’t stick. I like my SP Fries dipped in lazy-gal aioli (Hellman’s/Best Foods mayonnaise with tons of minced garlic and a squeeze of lemon juice). Just about everything is good with garlic mayonnaise, though. Sound and look yummy! Great idea. Gonna give them a go! I always found the mushy thing disappointing in a sw.-potato-fry too. I was thinking of soaking the cut fries in ice water like is done for good regular fries…but this is definitely less time consuming. BTW – the cute dishes are no longer available and havent any ETA either. Whaaa. Very excited to try this out! Thanks!! I don’t like this post. I had managed to forget that I wanted french frie cups with matching sauce cups (or was it that I/my boyfriend convinced me that I didn’t need any..?) and now you just went ahead and reminded me just how great they look. I will like this post the day I decide to make sweet potato french fries however. 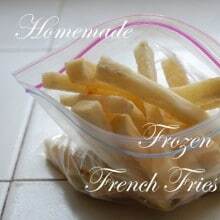 Maxwell & Williams French Fry cups…try this! What is the oven temperature for this, please? Love sweet potato fries. Oops! Said that already. Thanks much! Luv your blog, btw. 🙂 Bookmarked already! Okay, first. Those are YAMS. Second, I’ve been trying for YEARS to get them crispy. How did you figure this out? Gayle! Hmm. They were labelled as Sweet Potatoes at the store. They aren’t scaley or anything like a Yam. Why do you think they aren’t the dark skinned variety of sweet potatoes (which are often wrongly called a Yam?) Not being accusatory. Just curious! Do you know things I don’t know? I like to know everything. It’s a downfall. Lemme know! 🙂 I looked up all kinds of recipes and techniques on the Internet, weeded out the ones that didn’t work and combined a couple of techniques that did. It’s that whole “know everything” gene in me. ~ karen! Okay, I just read up on yams and sweet potatoes on wiki, and, well, sweet potatoes can be orange after all. Also, I think I was being a bit rude… sorry. I’m going to try these very soon. The funny part is, I was trying to make crispy ones the other day using the broiler, and I thought to myself I should submit an Ask Karen… but I forgot!! 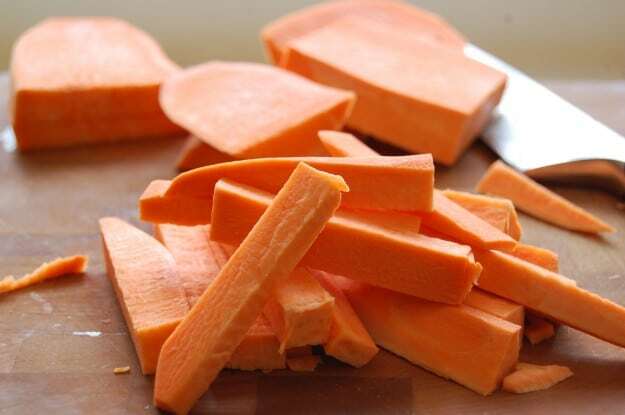 In the United States, sweet potato (Ipomoea batatas), especially those with orange flesh, are often referred to as “yams.” In the United States, firm varieties of sweet potatoes were produced before soft varieties. 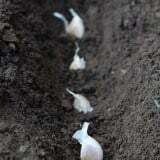 When soft varieties were first grown commercially, there was a need to differentiate between the two. 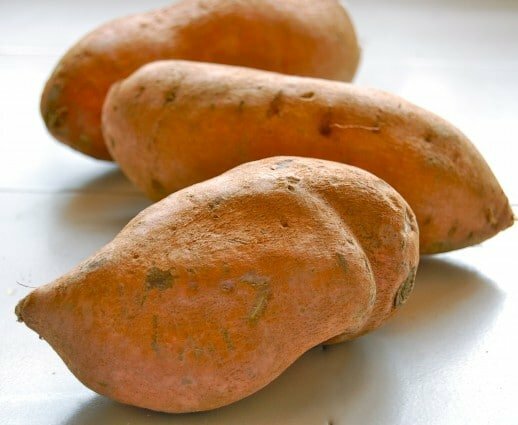 African slaves had already been calling the soft sweet potatoes “yams” because they resembled the yams in Africa. Thus, soft sweet potatoes were referred to as yams to distinguish them from the firm varieties. Sweet potatoes labeled as “yams” are widely available in markets that serve Asian or Caribbean communities. Hold on; let’s not let this slip by too fast. I had understood yams and sweet potatoes were two different things and got into conversations with family who I now, out wisdom with this conversation. It went to the point in the supermarket, they were all called Yams, I went to the produce guy, fresh out of kindergarten, and he said they were the same thing, I got back to the shack and they were not the same things, in the bag, I indeed had two different products. He, thinking they were the same had put them all together and listed them under Yams. I go to the guy with the grey hair now and ask and do get sweet potatoes. So, yes there is a difference. I’m making these for my in-laws tonight! My kids have always resisted sweet potatoes. Maybe if they are crispy they’ll enjoy them. Bonus: I’m roasting off an extra tater for my wee! Great tips…thank you. 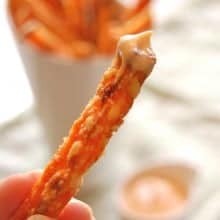 I love french fries but sweet potatoe fries are pretty good too especially with the right dipping sauce. Can’t wait to try this one. This Canadian is so proud of you! I’ve always loved you on TV. 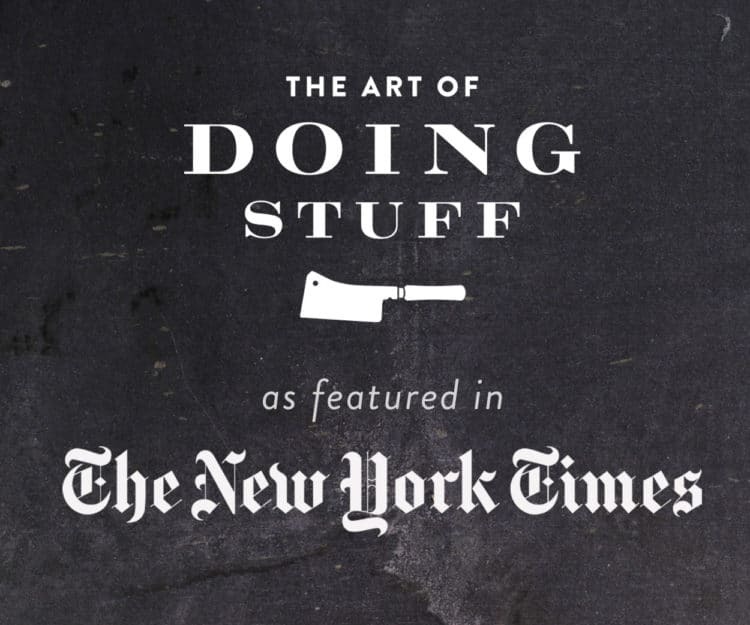 How is it you get even better in print? And now, as if it couldn’t get better, you share the secret of crispy sweet potato fries on the absolute day I have been bemoaning the limp disasters I keep producing. As a breast cancer survivor I can’t indulge in normal fries as often as I’d like, but these, especially with Sriracha dip, these are going to be my new, healthy, crack. Bless you! Well I made an attempt but they weren’t quite as crispy as I was hoping for. I think I must have used too much corn starch and maybe not enough oil? Will definitely be trying again though! Less corn starch, more oil = a tasty success! Thanks! How long do you usually soak them in cold water? And what does the soak do? Thanks! Hi Jan – A lot of restaurants soak their fries all day in water. I’ve read it should only be for an hour or two. 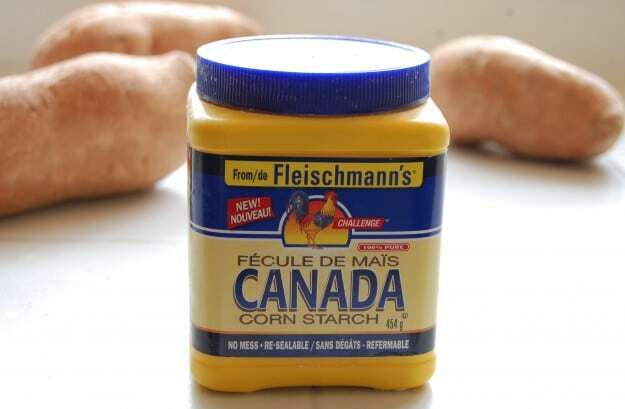 It removes a lot of the starch. That’s why the water is cloudy when you remove them. Removing the starch from the potato makes a crispier fry and it helps to stop them from stick to each other and your pan. (you have to let them dry before cooking them by rolling them in a dish towel) ~ karen! Ooh! Ok, we soaked our potatoes for an hour, then went straight to the cornstarch. They were so mushy… The cornstarch just got all gooey over them, so we added more after letting them sit for a while, but I knew I wasn’t missing a step, and then they were in the oven 3x as long and skipped right to getting burnt… Ok. Dry them off, first. That will probably help. Thanks! Same thing here. I ended up with way too much cornstarch on my SP. I thought maybe I should towel them off first but I didn’t see that mentioned in the steps and I wanted to follow the directions to a “t”. They were still awesome-but next time I’m sure they will be even better. The dipping sauce was off the hook!!! I tried making them once, and you’re right they were soggy. I didn’t even try again b/c I didn’t know you could make them crispy. I will definitely try this!! As a matter of fact I just bought some sweet potatoes today. I was just gonna bake them, but your fried sweet potato recipe has tweeked my interest. I think I’m gonna go for it. I got so excited when I saw the title cause Sweet Potatoes are allowed on my stupid meal plan but I’m pretty sure corn starch is not allowed cause it’s from corn and has starch. Urghhh. Still I’m going to try it for the days when I don’t follow the stupid meal plan exactly. 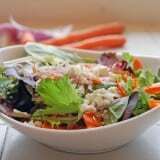 Hi Linda–can you have potato starch? 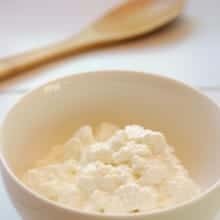 Or rice starch? I’ve tried these with potato starch and they were very good. Rachel – Yes, it sounds like you had too much corn starch. You really just need a very light dusting of cornstarch. The first time I tried them this way I used too much cornstarch as well. And make sure each and every fry is covered in oil. If you have a deep fryer try them with the cornstarch and deep frying them. The oven method is definitely more difficult to get the hang of, but once you figure out the proportions of corn starch and oil you’ll be set. ~ karen! I just made them again with very little corn starch and lots of oil and they came out perfect! My 3 year old and one year old gobbled them right up! this idaho girl and self proclaimed (idaho russet) french fry expert is going to have to try this! I love sweet potato fries but never have any luck, and eating it with sirachi sauce might just be the best idea ever! Booo. I tried these last night, imagine my entire cooking process with “womp womp womp wommmppppp” music as my background. I followed the recipe to the T, and they came out black and burnt, soggy, and tasted like corn starch. Reviewing the comments I will try again with MORE oil and less starch, though my pre-cooked fries looked exactly like yours, if your photos didn’t even look more starch-y. I think I may have not coated each fry as good as I should have – at least that is what I’m trying next time. Tiffany – Yes, there’s a learning curve with these fries. If you can’t be bothered to go through the learning curve, you can always just chuck them in the deep fryer. You *still* have to add the cornstarch if you’re going to deep fry them though. Sweet Potato Fries don’t even get crispy in a deep fryer unless you use cornstarch. Good luck! Oh! And if they turned out black your oven might be running a bit hot! You should check it to make sure. ~ karen! Thanks Karen 🙂 I don’t own a deep fryer and I would be scared as hell to attempt to operate one anyway. ;o) I will try in the oven again. The bottoms were black, not the tops. Like when I pushed them off the pan they were charred below. ACK! I will be using a different oven anyway, I tried making them for my dad for father’s day in my parents oven and I think their knobby old-school oven isn’t entirely accurate! Elle – I’m guessing you just didn’t use enough oil or didn’t coat them properly with the oil. Try a bit more oil. And like I say if it’s too hard to get the hang of, use a deep fryer. ~ karen! you have solved a dilemma that has plagued me for years. Thanks for this! I have a “Puerto Rican Fryer” a friend gave me that I’ve never used. As much as I want to deep fry things, I can’t bring myself to do it. Between the fat (on my body) and the smell lingering for days, I … well, I’ll be baking mine, and these look amazing. Thanks! Now this may sound stupid but… my man has been asking me for crispy sweet potato fries,so far not happening… do I skip the olive oil process if I use the deep fryer?? and is there a need for pre frying?? Wow! These sound easy and delicious. Making these. TONIGHT. Thanks for sharing!